Flax fibre which characteristics include great strength, fineness and durability make this the ideal fibre for our Chatham Hemp Rope. The fibre is stronger than cotton and also stronger when wet than dry. Flax is an annual plant, which when fully grown reaches a height of 50 to 100 cms. When approaching maturity (after 70 to 100 days depending upon weather conditions), blue (vulgare) or white (album) flowers are produced depending on the variety. Generally speaking the blue flowered variety produces fine, good quality fibre whereas the white-flower plant produces stronger but coarser fibre. Flax is grown in wide areas of temperate and sub-tropical regions of both hemispheres. Flax fibre is obtained from the stems of the LINUM USITATISSIMUM plant, belonging to the LINACÆ family. The use of flax for weaving into "linen" cloth dates back to Egyptian dynasties over four thousand years ago and from the latter part of the Middle Ages it became the most commonly used textile material in Europe. It was not until the early part of the nineteenth century that cotton began to challenge this premier position. The strands of flax fibre are embedded longitudinally in the stalk of the plant, between the outer epidermis and the central woody tissue. The fibre, which is very high in cellulose, is extracted first by "retting" (rotting either by water or dew) and then by "scutching" the stalks. Following the process of retting, the straw is dried and then scutched, a process which by mechanical means breaks down the pith, or "boon", and removes it as completely as possible from the fibre. There is not a standardized grading system. Sales are effected based on samples delivered from each annual crop. There are, however, accepted "high", "medium" and "low" quality parameters. Manila Rope is made using ……. Abaca, another member of the "hard" fibre group is the Spanish name for what is more widely called Manila hemp, and is indigenous to the Philippines. When mature the abaca plant consists of about 12 to 30 stalks radiating from a central root system. Each of these stalks is about 12 to 20 feet high and the fibre is stripped from the stem rather than the leaf, with each stalk being cut into sheaths and then strips or "tuxies". The strips are then scraped (i.e. either hand or machine "decorticated") to remove the pulp, then sometimes washed and dried. The outer leaves of the plant are wider and contain more but coarser fibre than the inner leaves. Harvesting of the stalks usually takes place between 18 and 24 months from the first shoots. The Republic of the Philippines remains the largest producer at around 50,000 tons per annum, but over the past 40 years production has been developed in Ecuador which today produces some 11,000 tons. Production in the Philippines is based on a "smallholder" system of agriculture, with most farms being between 3 and 5 hectares in size. The Ecuadorian system is more reminiscent of the African sisal industry and is essentially a large estate-based industry although there is also a substantial smallholder Co-operative movement. Manila hemp, which became known to the western commercial world in about 1820, was, until the advent of henequen, used for general cordage purposes where it largely replaced true hemp and flax. Until the advent of the first synthetic fibres manila was the premier material for marine ropes where its strength, lightness and water-resistance were appreciated. 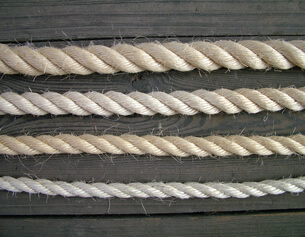 Today, although marine and other ropes are still important, it is mainly used in the paper making industry. Because of its relatively long staple length, strength and cellulose content, it is particularly used in the manufacture of a range of specialised papers including tea and coffee bags, sausage casing paper, electrotytric papers, currency notes, cigarette filter papers, medical /food preparation/disposal papers and some high-quality writing paper. There is also a thriving abaca fibre handicraft industry operating in the Philippines, exporting on a world wide basis. Sisal Rope is made using …..
Sisal plant has a 7-10 year life-span (longer in Mexico where growth is slower) and is usually cut first after 2-3 years and then at 6-12 month intervals. A typical plant will produce 200-250 commercially usable leaves in its life-time (hybrid varieties up to 400-450 leaves) and each leaf contains an average of around 1000 fibres. The fibre element, which accounts for only about 4% of the plant by weight, is extracted by a process known as decortication. In East Africa, where sisal is produced on an estate basis, the leaves are in the main transported to a central decortication plant after which the fibre is dried, brushed and baled - for export or for use in the domestic mills. In Brazil it is mainly grown by small-holders and the fibre is extracted by teams using portable raspadors. East African sisal, being washed and decorticated, is considered to be superior in quality to Brazilian sisal (although the latter is more than adequate for the manufacture of agricultural twines and general cordage and is used domestically in craft paper production) and, in normal times, commands a significant price premium on the world market. 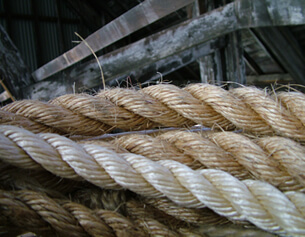 Traditionally sisal was the leading material for agricultural twine ("binder" and "baler" twine) but the importance of this has now diminished (with competition from polypropylene and other techniques) although there is still a major business between Brazil and the United States. 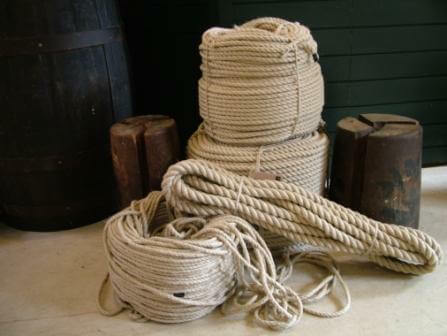 Apart from ropes, twines and general cordage sisal is used in both low-cost and speciality paper, dartboards, buffing cloth, filters, geotextiles, mattresses, carpets and wall coverings, handicrafts, wire rope cores and macramé. It is also used as a binding material for plaster mouldings as well as in the construction industry to reinforce plaster in ceilings and walls. In recent years sisal has been utilised as a strengthening agent to replace asbestos and fibreglass and is increasingly a component used in the automobile industry, where its strength, "naturalness" and environmentally friendly characteristics are greatly appreciated.